I'd rather phrase this weekend's modus operandi as, "keeping the party going" than "saying goodbye to summer." I don't want to think of this as an end, but there's no defying time. Truly, this has been one of the best summer's of my life. There were so many days I woke up with a world of possibilities laying at my feet, each begging me to pick it up with offers of adventure and indulgence in the outdoors. The sweet, sticky strawberry picking of June. The hot, sweaty heat waves of July made enjoyable by multiple swims in the backyard pool. Watching my girls learn to swim. Summer turning two and fully taking on her new age with gusto and confidence. Our family vacation in August and road trips that proved to me what a family unit can accomplish with a map, a box of timbits, and the right attitude. Alas, it is the weekend before school resumes, and we all know this means an end to our summer spontaneity and adventures. When I wake up and go outside to water the last of my tomatoes on our drooping, yellow-leaved plants, I have to put on a sweater and socks. I have begun drinking tea in the morning again, to warm up. I have written out a list of fall house projects and put some of them into action. It's not over till it's over. This weekend is our last hoorah, and we are basking it summer's glow. We went to the secret pond with snacks and towels for a morning of swimming, joyfully sharing my little girls with my best friends (that's the best!). 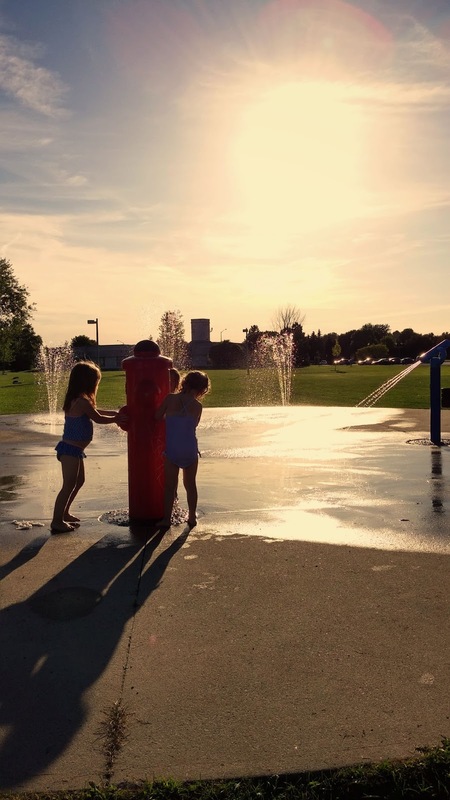 We met our neighbours in the park Friday night for pizza dinner beside the splash pad, and our crazy gaggle of girls alternated between splashing in the setting sun, climbing the play structures, wolfing down pizza and bolting before any mama could wipe down a dirty face. We swam and swam and swam. A much anticipated walk to the ice cream parlour down the hill after a big Sunday dinner. We're cramming our favourite things in with a "one last time" enthusiasm and sentiment. Then we'll succumb to our fates and begin looking ahead to September in earnest. I'll make and freeze some dinners for busy nights when Rich is working. We'll organize the lunch container cupboard and make sure we have shoes (not sandals!) that fit everyone. I'll get the girls their dance outfits for fall activities, and get the chimney cleaned. 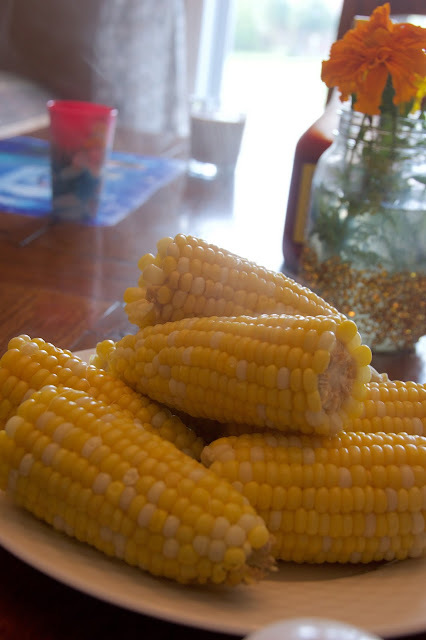 Then I'll put away the beach towels and harvest the last of the garden produce. Until next year.